After two years, the War Department has given Puerto Rican Americans the same opportunities as any other American, to enter the United State Army and fight for the Nation as well as to obtain such benefits as could certainly be of advantage to the underpaid, inadequately educated Puerto Rican, who has little opportunity to improve himself. Puerto Ricans, it is stated, will now be able to enter the army and have their lots improved learning trades that will not enable them to help win victory, but will afford them a means to a better livelihood after the war, thus benefiting themselves and raising the standards of their communities and of Puerto Rico. The editorial was written in response to an announcement by the War Department that it would drop higher educational qualifications for Puerto Ricans for admittance into the U.S. Army. The local selective service units in the Island were instructed to require a 4th grade education for acceptance into the army, which was the standard for Continental Americans. In the previous years, natives of the Island had been required to have at least an 8th grade education in order to be considered for service. On October 1943, the Mayagüez Lions Lions Club initiated the complaint that culminated with the War Department reestablishing same parameters for Puerto Rican and Continental recruits. With the end of the Second World War in sight, U.S. congressmen discussing a bill to make the office of the governor of Puerto Rico subject to election could not help but wonder what impact this measure would have in helping to modernize and democratize the island. Puerto Rican and Continental Americans residing in the island testified before Congress that through their willingness to support and participate in the war effort, the Puerto Ricans, especially the tens of thousands who joined the U.S. military, had shown they could be trusted to carry out both tasks. Congressmen were notably worried about the possibility that the returning soldiers might cause unrest in the island if reemployment opportunities were not readily available. Those testifying on the matter were quick to stress the need to create economic opportunities, but they also pointed out that political development was necessary and ultimately linked to the returning Puerto Rican soldiers and the peaceful decolonization of the island. Though very few of the roughly 65,000 Puerto Ricans who served during WWII would see combat-they would be instrumental in the post-war years for the socio-economic restructuring of the island. Moreover, they would provide the native know-how to carry out Operation Bootstrap. The vast majority of these soldiers came from the popular sectors of the island. A majority of them would join an expanding middle class thanks to the G.I. Bill. In the process they changed Puerto Rico’s society. 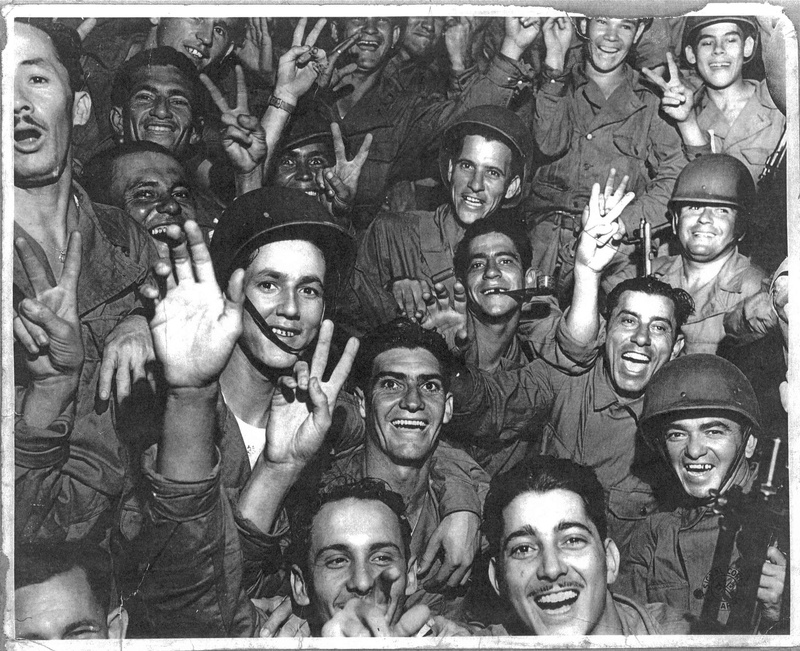 Puerto Rican soldiers celebrating the end of the war.